In every season, on every holiday, at every moment, the young men and women of the Israeli Army protect the people of Israel and all of those who come to visit friends, family and the country’s holy sites. Since moving to Israel over 40 years ago, founder, David Landau has spent countless nights delivering packages as tokens of gratitude to these young soldiers in order to make their service more pleasant. 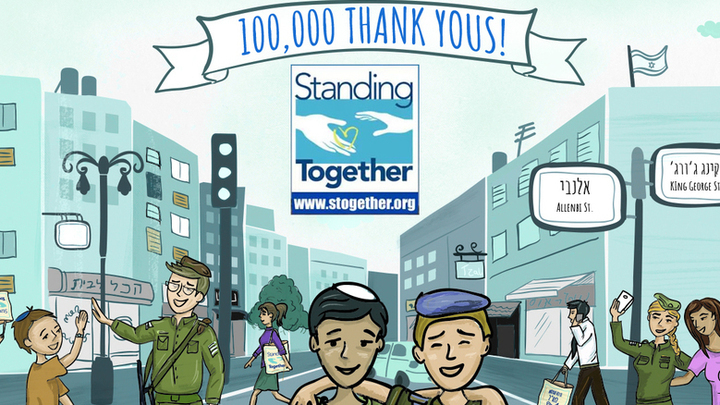 In 2003, he founded Standing Together www.stogether.org to expand this mission and to enable others to express appreciation to these heroes throughout Israel. Funded entirely by donors from all over the world, Standing Together provides relief not only to the soldiers who serve in Israel’s armed forces, but also to Israeli citizens whose lives are under constant threat of attack. Over the years the number and range of Standing Together's programs has expanded. Whenever there is need, be it at times of war or over the Jewish holidays, Standing Together can be found distributing cheer, goodwill, appreciation and treats at military bases all over the country. We rely heavily on volunteers and donations to accomplish our mission. This is done by means of the Standing Together Hospitality Trailer, a truck - trailer, which is equipped with an oven, coffee machine and freezer. Volunteers distribute treats to soldiers in order to let them know that they are not alone and forgotten. Our Hospitality Trailer also houses a mobile cell phone charging station for those soldiers who might need it. Standing Together utilizes the latest trends in technology to strengthen the connection between our supporters and IDF soldiers. Using the popular social media networks Facebook and Twitter http://twitter.com/Stogether, Standing Together enables our soldiers' peers to get involved and connect with the young men and women who are serving Israel. Our Facebook page is constantly changing, sending updates to thousands of people all over the world. Join Standing Together’s group on Facebook http://www.facebook.com/stogether to get the latest information on our activities both in Israel and abroad. You are invited to watch exclusive videos, interact with other supporters and share your ideas for how to help our soldiers.